Our environmental problem is not a problem of trees and of water. It's a problem of politics, of economics. About 22,000 years ago, Palawan was already inhabited by man. This is proven by the discovery of fossil remains ... Where he came from. . .is not known ... perhaps he was one of those born in the Garden of Eden and wandered to Palawan. Or it could have been that the Garden of Eden was right here in Palawan instead of in the valley of the Tigris-Euphrates as supposed. As recently as 1900, lush tropical rainforests carpeted most of the Philippine archipelago. At the current rate of deforestation, however, the country will enter the twenty-first century a barren landscape, with nearly all of its rainforests destroyed. No province better illustrates why the Philippine tropical rainforests are disappearing than the long, narrow island of Palawan, some 350 nautical miles southwest of Manila. There, an unfolding drama of people, power, and politics has turned Palawan into a microcosm of the rapidly vanishing tropical rainforests throughout the country and in many parts of the world. Palawan is the Philippines' last frontier. Its relative isolation from the rest of the archipelago spared many of its resources from the systematic exploitation practiced elsewhere. As the planning and development coordinator for the province phrases it to us, "Palawan has been thrown out into the China Sea." Indeed, its closest neighbor is not even another Philippine island, but the Malaysian state of Sabah on the island of Borneo. It is said you can use a five-battery flashlight to signal between Palawan and Borneo. In fact, we are told, in the Pleistocene period a land bridge linked the two islands. Until recent decades, the rest of the Philippines viewed Palawan simply in terms of its isolation; the island has long hosted a leper community and a convict colony. As transport costs fell, however, and as the other islands were increasingly overlogged and overfished, it became only a matter of time before Palawan was "discovered" by thousands of poor farmers and fishers from other islands— and by big commercial loggers. Today, Palawan is covered with one of the Philippines' largest continuous tracts of tropical rainforest. But the forest's days are numbered if the present rate of logging continues. As a result, Palawan has become the center of one of the fiercest environmental battles in Southeast Asia, a battle taken up in early 1988 by one of the Philippines' most influential environmental groups, Haribon (a contraction of the Tagalog words haring ibon, meaning "king bird," in reference to the endangered Philippine eagle). Among the first Palaweños we interview are a group of local environmentalists, who in 1989 are in the process of setting up in Palawan Haribon's sixth chapter. But they defer answering many of our questions; they insist that the only way to understand what is happening to Palawan is first to hike into its rainforests. We agree to do just that, with some of these local environmentalists as guides. A hike into Palawan's rainforests requires both time and patience. We wake up early to catch the one daily jeepney that runs from the provincial capital of Puerto Princesa to our first stop, Baheli. Jeepneys in the province are just like jeepneys in Manila—except that they are often several times more crowded. Initially we perch on a thin piece of wood that is balanced across the back of the vehicle, where passengers get on and off. Luck is with us, however: after about half an hour we get seats inside the jeepney. True, the jeepney is a bit crowded: there are eight people on each side, as is usual, but added to that are three young children standing in the center, two women who replace us on the board, and three men who dangle rather precariously off the back, their feet balanced on the running board, plus several live chickens (feet tied) and one very scared, squealing piglet in an old rice sack. On the roof, rattling around with the baskets of food and wares, cling another twenty or so men and boys who enjoy the view and endure the blaring tropical sun. After a couple of hot, dusty hours (roads in the provinces are seldom paved), we arrive at Baheli, a small fishing village on a river. Here the jeepney route ends. Now we are confronted with a typical Palawan problem: no more roads. We talk the owner of a banca—a fishing boat, in this case, small and motorized—into carrying us on our journey's next leg, down the river. A young boy stands at the boat's bow, a long bamboo pole in hand, to help guide us along the narrow, shallow river. Exchanging constant banter, he and the driver maneuver the boat between the incredibly thick mangroves that line the river on both sides. After an hour we reach the point where the river spills into a spectacular bay that feeds the South China Sea. We hug the northern coast of the bay, gliding over transparent water, until we reach another mangrove-lined river and turn inland. Soon thereafter, at a grouping of a few huts, we disembark. An old logging road runs from this community to the area where we will spend the night. But the noontime tropical sun is fierce, forcing us to respect siesta hours. We stop at the open hut of an old farmer (whom, out of respect, we call tatay, "father") and ask if we can take refuge until the heat subsides. When we begin our hike, we do so accompanied by a sled-like cart drawn by a carabao (water buffalo), rented for the pesoequivalent of $2.50 from tatay's neighbor to pull our food and belongings. Carabao are the main work animals and the only technology most Philippine peasants ever dream of owning. (At a cost of about the equivalent of $250 per animal, however, even carabao remain an unaffordable dream for many.) They are said to be very dependable animals. But, as we discover, because they do not sweat and therefore have to be bathed every few hours, be it in a river or a mud puddle, as a means of transport they are slow. As the sun sets, we stop for the night in a small barrio nestled between two mountains. The next day, we hike in the morning and then board another fishing boat for the final leg of our journey. The scene from the water looking landward is magnificent. Tall mountains, blanketed by lush forests, plunge dramatically to the shimmering sea. It is, we remark, much like the scenes all around the country that would have greeted Spanish explorers in the sixteenth century or the Chinese traders centuries before. As we trek, we see few signs of civilization. Virgin forests of ipil, almaciga, balete, and other majestic trees surround us, peak after peak. Monkeys chatter over our heads, stopping to stare in silence when they spot us, as interested by us as we by them. At intervals, narrow waterfalls cascade from limestone cliffs into the emerald waters below. We pause occasionally to pay our respects to trees so huge that when three adults circle the trunks, arms outstretched, fingers barely touch. Underneath an enormous mountain, with a cathedral-like dome so grand it has acquired the name of St. Paul's, we paddle a small banca up a long underground river, its caves illuminated solely by the light of our kerosene lantern. Thousands of bats and swifts soar and dive overhead. The surrounding forests, as one of our Palawan-born guides proudly tells us, are "one of the world's last living libraries of ecology." Yet, as we hike, the singing of the birds is often disturbed by the roar of chain saws, even as we enter areas near the underground river that have been declared part of the Philippine national park system and therefore officially off-limits to logging. At one point, our guides point to thin green saplings growing alongside the trail. These are falcata (Albizzia falcataria), fast-growing non-native softwoods planted as part of the logging concessionaire's reforestation program to replace native hardwood (Dipterocarp) species that have been cut down. One guide silently motions us to follow him off the logging road and into the falcata. We find that the falcata replanting simply hugs the trail. About ten feet off the road, the reforestation ceases abruptly. The reforested strip is designed to give the impression that, as is required by the logging concessionaires' license agreement with the Philippine government, which "owns" this forest land, reforestation has been accomplished. Instead, nestled between that reforested strip and mountain-sides still green with hardwood forests lies a large, flat expanse that has been clear-cut. Scruffy green bushes dot a field scarred with tree trunks and brown debris, dead branches and leaves. Here and there, felled but unwanted logs crisscross it. (The scene reminds us of a statistic cited by Nicholas Guppy, who has studied tropical rain-forests the world over for more than thirty-five years: "Frequently 90-98 percent of trees are left unused when an area of rain forest is logged ... Where 10 percent of trees are extracted, around 55 percent are usually irreparably damaged.") 2 "This area was clear-cut in the early 1980s," says one of our guides, adding that it worries him, because it is the source of water for the underground river. These comparisons are important, our guides stress, in understanding who is and who is not to blame for the deforestation in these last rainforests. Both the Philippine government and the big loggers have long placed most of the blame on the millions of Filipino peasants who now inhabit the country's upland areas. Through forms of shifting (commonly but pejoratively known as "slash-and-burn") agriculture and tree-cutting for fuel, the argument goes, these upland farmers have been chopping down the Philippine forest. In other words, poverty is blamed for the deforestation. According to Pagdanan's full-page advertisements in the nation's leading daily newspapers, the blame for the disappearance of Palawan's forests lies at the door of "slash-and-burn farmers, settlers, and illegal loggers who indiscriminately cut the trees." 11 Indeed, the logging company claims that it actually protects the forests; 120 Pagdanan guards are armed with high-powered rifles to keep Palawan's 21,000 shifting agriculturalists from clearing portions of the forests to plant subsistence crops. This argument angers our guides. "The biggest kainginero [slash-and-burn agriculturalist] is Pepito Alvarez," one says. He reminds us that the clear-cut area we saw earlier in the day was cut down by Pagdanan. That area is not an isolated case, the guides say. Indeed, we later meet a number of former Pagdanan workers who have lodged a complaint with DENR, charging that Pagdanan practices illegal logging (including clear-cutting and cutting of under-sized logs) and that its reforestation program is a showcase limited to the sides of the roads. The workers show us dozens of photos to prove the charges. In Palawan we learn not simply that a few individuals control the resources. We learn how such a system is maintained. Palawan is testimony to the fact that the environmental issue in the Philippines and in much of the Third World is primarily a question of power. Palaweños often refer to Pagdanan as people did to the legendary banana companies in Central America at the turn of the century: as El Compañia ("the company"). For all intents and purposes, Palawan is a company island. Control of natural resources—forest, minerals, fishing grounds, or agricultural land—gives economic power. That "economic power," as one of the few local politicians who is willing to meet with us explains, "is always political power if you know how to use it." Our trip to Palawan comes at an historic moment: electoral democracy has returned to the Philippines after two decades of the Marcos dictatorship. Corazon Aquino is in power; elections have been held for local, provincial, and national offices. Yet, the island of Palawan feels eerily like the Philippines during the days of martial law. There are politicians opposed to Alvarez, but most are circumspect in voicing their opposition. Says one to us in reference to the rule of the logger and his political allies, "Theirs is a reign of terror." That reign includes attempts to censor opposing views. The province's two newspapers and single radio station are controlled by politicians close to Alvarez. An application by an opposition group for a second radio station, we are told, was turned down by the national government. Around the time of our visit, copies of a Manila newspaper carrying an article critical of Palawan's power structure mysteriously disappear. Days later, copies of the article are distributed clandestinely, in the belief that mere possession of the copied page could bring down reprisals. Subsequently, a person quoted in that article is physically assaulted. At least one civil servant with Haribon connections is reportedly threatened with dismissal. In Palawan, environmentalists talk quietly in restaurants, changing the subject quickly if someone passes nearby. They often look over their shoulder as they walk. Says one Manila-based environmentalist who visited Palawan a couple of months after we were there, "I know I was followed during my last trip there." A reporter who co-authored the Far Eastern Economic Review article about Palawan and Alvarez not only was slapped with a large libel suit but also received a death threat. Both presumably are attempts to frighten other reporters away from the story. The former Pagdanan workers who lodged the complaint against Alvarez with DENR also brought a case against him with the Department of Labor, citing unfair labor practices and violation of labor law. They filed yet another with the Commission on Human Rights, charging that the Philippine military gave training to Pagdanan's guards who, in turn, have murdered several individuals. These workers too have felt Alvarez's power. According to one former Pagdanan worker, Alvarez initially laughed at the workers' case, boasting to some of them that he could buy off any lawyer they found. It was a threat he appears to have been able to follow through on three times—until leading human-rights lawyer Augusto "Bobbit" Sanchez (Aquino's first labor minister) offered to represent them. More personal threats of reprisals against them and their families have forced the labor leaders to leave Palawan. A battle is now pending in the lethargic and often corrupt Philippine courts. As the worker tells us: "It is very hard to win if your opponent is a rich person. ... This is a government of the rich. We are poor, so there is nothing for us." Indeed, Hartmann and Boyce's tubewell story is replayed in Palawan, only this time it is about trees, not irrigation facilities. The executive vice-president of Alvarez's Pagdanan Timber Products informs us that Alvarez's company is among those applying to DENR for some of the money from an Asian Development Bank loan for Philippine reforestation: "We intend to avail [ourselves] of the ADB reforestry loan. We want to get a big portion." The Asian Development Bank and the other multilateral development banks have billed this and other reforestation loans as part of their answer to complaints by Western environmental groups that they do not lend enough for environmental projects. But the on-the-ground reality is somewhat different, as longtime Philippine-based Irish Columban missionary and ecologist Sean McDonagh elaborates to us: "When you say the Asian Development Bank is going to replant trees, everyone claps. But [the ADB loan] isn't for real reforestation of hardwood forests. It is to put plantations on the hills, which will be monocropped. And the very people who replant it will be the loggers who took the original forest down," who will then, of course, get richer taking it down again. Pagdanan's concern is not hardwood forests for Palawan's future generations. Rather, as that top executive of Pagdanan readily admits to us during an interview in Manila, Alvarez's plan for the ADB loan is to plant fast-growing softwood trees for his plywood plant, thereby ensuring his own economic future after the natural forests have disappeared: "Sooner or later, we'll be going into processed woods. Lumber may be a thing of the past later on." The idea is to prepare for that eventuality: "When our leases run out, our industrial tree plantations will tide us over." Haribon members to whom we talk are excited about the swap but caution extreme care in moving forward with similar undertakings. The swap was announced before meaningful discussions could be carried out with intended beneficiaries about how the money could best be used and managed. Indeed, there seems to have been neither time for such discussions nor a realistic plan as to who would initiate them. Logging interests in Palawan capitalized on this by telling small-scale fishers that the swap would deny them access to their fishing grounds. The charge was untrue, but the damage difficult to undo. This incident underscores the necessity of carrying on extensive discussions with local people to define such programs. As we learn in Palawan, to reverse deforestation requires consciously taking the side of those who are battling against timber tycoons like Alvarez and for the democratization and redistribution of forest resources to the people who live there. As long as they keep these basics of power and politics constantly in mind, Western and poor-country environmentalists together represent a strong force in reversing the destruction of natural resources. Sometimes the stories of life with El Compañia seem almost humorous. Haribon president Junie Kalaw tells of being invited to speak before the Palawan provincial board: "One member of the board invited me. But after I spoke, a resolution to 'thank Haribon' [for speaking] became such a contentious issue that the board had to recess." Eventually the resolution was voted down, seven to four. For a time, Haribon was notified that it was banned from Palawan. The Pagdanan executive vice-president explains to us that, among other things, "Haribon would like Palawan to stay in the iron age." To be an environmentalist in Palawan these days is to court harassment, threats, and even death. A local official in Palawan who tried to stop illegal logging was murdered, allegedly by bodyguards of one of Palawan's biggest politicians. 21 Merely saying the word environment out loud in Palawan can get you in trouble. That, one shaken local-government official who has no involvement with Haribon relates to us, is all he and some friends did one night over beers in a Palawan bar. "Four drunk men, big men, approached our table. One threatened: 'You, Haribon, you get out of Palawan.' They ignored our denials. We left quickly. ... 'We'll remember your faces,' they shouted after us." Palawan's trees and Alvarez are participants in what Sean McDonagh calls a "plunder economy." Like McDonagh, many local environmentalists believe that the current environmental crisis and the inequity that breeds it are endemic to the Philippine development strategy. Dating as far back as the Spanish and U.S. colonial periods, that strategy has been to grant a near-monopoly over natural resources to a few individuals and firms. For decades, gold, copper, timber, and agribusiness firms—both foreign and, more recently, Filipino—have been offered incentives to extract the maximum amount of resources at the minimum cost, with most of the resources earmarked for export. Facing virtually no environmental controls, firms have torn up the soil, the forests, and the coral reefs with little regard for anything beyond their own short-term profits. Under President Aquino, DENR has reduced the number of concessionaires and has attempted to press them to replant more forests. And it has increased government taxes on cut timber and rents for the holders of timber licensing agreements. But the charges are still far below reforestation costs and still encourage maximum exploitation in the shortest period possible. 27 The reforms have not changed the overall system in any significant way. As one environmentalist explains to us, "We're still subsidizing the loggers." The more than $3 billion now paid annually as service on the foreign debt exceeds the amount that comes into the country as new aid and loans. The resulting negative net resource flow—a reverse Marshall Plan of sorts—puts the Aquino government in a constant frenzy to generate more dollars to repay its creditors. The burning question is, How to get ahead of those debt repayments? International development experts and creditors (including the World Bank, the International Monetary Fund, and the United States' Agency for International Development) prescribe a certain solution, which the Aquino government continues to follow: Spend less and export more. 30 That means, Ship out more wood products, minerals, fish, prawns, and cash crops such as pineapples and bananas, as well as such manufactured goods as garments and electronic parts—all already among the top exports. The export frenzy to earn foreign exchange to repay the Marcos debt reinforces the activities of Alvarez and others involved in the extraction or destruction of natural resources. (In 1988, official export earnings from timber were $200 million.) 31 Debt did not cause the Philippines to become a plunder economy; the country had started on its path to plunder long before. What the debt burden did was add one more reason to allow the plunder to continue. But the people of Palawan are fighting back. We extend our stay in the capital city of Puerto Princesa to witness a congress held by Palawan's local environmentalists. Attending the meeting are delegates representing a wide cross-section of Philippine society: former Pagdanan workers, small farmers, bird watchers, lawyers, schoolteachers, government employees, a member of the military. A month later, in May of 1989, 250 of Palawan's environmentalists gather for a formal launching of their local chapter of Haribon. Chapter members are already involved in a campaign to preserve the watershed of Palawan's capital city and in an effort to stop the export of rare animal species. Within a matter of months, they begin an artificial reef project in Puerto Princesa and a livelihood project with the Batak. Those at the launching are well aware that their mere presence is a serious statement. And no one there contests the fundamental reality of Palawan inequality: one logger is far more powerful than all of them in terms of political connections, financial resources, and sheer force—"goons, guns, and gold," as the Philippine cliché goes. yet, the participants tell us, they are confident they can stop the plunder; they are confident of being able to organize others on the island and then link them to broader national and international campaigns to save the last rainforests here and elsewhere. "Palawan," one of them says with conviction, "is important to the whole world." The environmental activists of Palawan represent a new breed. Rooted among farmers, fishers, and workers, their network includes allies in the middle and professional classes. The phenomenon is not unique to the Philippines' last frontier. Such groups are cropping up all over the country. As in Palawan, despite growing repression, their ranks are swelling, as are their connections to broader campaigns for sustainable development. An earlier version of parts of this chapter appeared in Robin Broad and John Cavanagh, "Marcos's Ghost," Amicus Journal 11, 4 (Fall, 1989). Note 1: Department of Environment and Natural Resources, "The Philippine Environment," briefing paper on the state of the environment, Manila, 1989, p. 29; Dames & Moore International, Louis Berger International, and Institute for Development Anthropology for the United States Agency for International Development, Sustainable Natural Resources Assessment—Philippines: A Review of the Present Status with Recommendations for Future Directions, U.S. Aid Project 398-0249 (Manila: U.S. Agency for International Development, September, 1989), annex D, p. D-13; and J. Honculada Primavera, "Intensive Prawn Farming in the Philippines: Ecological, Social, and Economic Implications," Ambio 20, 1 (February, 1991): 29. Back. Note 2: Nicholas Guppy, "Tropical Deforestation: The Global View," Foreign Affairs 62, 4 (Spring, 1984): 949. Back. Note 3: See James F. Eder, On the Road to Tribal Extinction: Depopulation, Deculturation, and Adaptive Well-Being Among the Batak of the Philippines (Berkeley: University of California Press, 1987). Back. Note 4: The figure of 19,000 hectares cited in this paragraph is from Melanie Manlogon, "Interview with Maximo T. Kalaw, Jr.: A Million Signatures for Palawan," National Midweek 3 (July 6, 1988): 15. The 54 percent figure was given by Kalaw in personal correspondence to the authors, June 23, 1989. In addition to the interviews we conducted and the National Midweek article, the information on Alvarez in this paragraph and the next comes from James Clad and Marites Vitug, "Philippines: The Plunder of Palawan," Far Eastern Economic Review (November 24, 1988): cover story; and transcript of interview with Maximo Kalaw, Jr., conducted by Dolores Flamiano, John Gershman, and Walden Bello, staff of the Philippine Resource Center Monitor, Philippine Resource Center, Berkeley, California, May, 1989. Back. Note 5: Ruffy Manaligod, ed., Struggle Against Development Aggression: Tribal Filipinos and Ancestral Domain (Quezon City: Tunay na Alyansa ng Bayan Alay sa Katutubo \[TABAK\], 1990), p. 3. This situation is not unique to the Philippines. As a World Resources Institute study notes: "Throughout the world, governments largely determine how forests should be used ... According to a comprehensive FAO assessment, in the Third World over 80 percent of the closed forest area are \[sic\] public lands" (Robert Repetto, The Forest for the Trees? Government Policies and the Misuse of Forest Resources \[Washington, D.C.: World Resources Institute, 1988\], p. 1). On the Philippines, see also Owen J. Lynch, Jr., "Colonial Legacies in a Fragile Republic: A History of Philippine Land Law and State Formation," Ph.D. dissertation, Yale University Law School, 1991; and Antonio G.M. La Viña, "Recognition of Ancestral Domains: An Imperative for Democratic Upland Resource Management," in Chip Fay, ed., Our Threatened Heritage: The Transcript, Recommendations, and Papers of the Solidarity Seminar on the Environment (Manila: Solidaridad Publishing House, 1989). Back. Note 6: Transcript of interview with Kalaw by Flamiano, Gershman, and Bello, pp. 2-3. Back. Note 7: Isagani de Castro, Jr., "Money and Moguls: Oiling the Campaign Machinery," in Lorna Kalaw-Tirol and Sheila Coronel, eds., 1992 and Beyond: Forces and Issues in Philippine Elections (Quezon City: Philippine Center for Investigative Journalism and the Ateneo Center for Social Policy and Public Affairs, 1992); and John McBeth, "The Final Test," Far Eastern Economic Review (June 13, 1991): 35. See also Belinda A. Aquino, Politics of Plunder: The Philippines Under Marcos (Quezon City: Great Books Trading in cooperation with the University of the Philippines College of Public Administration, 1987); and Paul Hutchcroft, "Olìgarchs and Cronies in the Philippine State: The Politics of Patrimonial Plunder," World Politics 43, 3 (April, 1991). Back. Note 8: Sean McDonagh, S.S.C., The Greening of the Church (Maryknoll, New York: Orbis Books, 1990), p. 81. Back. Note 9: Manlogon, "Interview with Kalaw," p. 16. Back. Note 10: Manlogon, "Interview with Kalaw," p. 16. The budget figure was provided by a member of the Palawan provincial board. Back. Note 11: See, for example, the advertisement entitled "The Truth Behind the Palawan Forest Conservation Issue," Philippine Daily Inquirer, November 26, 1988. Back. Note 12: Transcript of interview with Kalaw by Flamiano, Gershman, and Bello, p. 2. Back. Note 13: Gareth Porter with Delfin Ganapin, Jr., Resources, Population, and the Philippines' Future: A Case Study, WRI Paper No. 4 (Washington, D.C.: World Resources Institute, 1988), p. 13. Back. Note 14: See Sheldon Annis, "Debt and Wrong-Way Resource Flows in Costa Rica," Ethics and International Affairs 4 (1990): 119, for an insightful distinction between the "merely poor" (who are resource optimizers and protectors) and the "very, very poor" (to whom this paragraph is refering). Back. Note 15: Nestor Baguinon, "Development and Conservation of Indigenous Non-Dipterocarp Trees and Shrubs," paper prepared for National Conference on Genetic Resources and Development, Tagaytay City, September 2-6, 1987, quoted in McDonagh, The Greening of the Church, p. 83. Back. Note 16: Norman Myers, who has been studying rainforests for decades, summed up the role and motivation of small farmers in a passage that merits quoting at length: "There is strong reason to believe the present deforestation rate will continue to accelerate for the foreseeable future unless vigorous measures are taken with due urgency to tackle the main causes of deforestation, viz. the commercial logger, the cattle rancher and the smallscale farmer. The third appears to account for much more deforestation than the other two combined, while being far less 'blameworthy.' In his main manifestation as the shifted (displaced) cultivator, the smallscale farmer is subject to a host of forces—population pressures, pervasive poverty, maldistribution of traditional farmlands, inequitable land-tenure systems, inadequate attention to subsistence agriculture, adverse trade and aid patterns, and international debt—that he is little able to comprehend, let alone to control. Thus he reflects a failure of development strategies overall, and his problem can be confronted only by a major restructuring of policies on the part of governments and international agencies concerned. Without an integrated effort of sufficient scope, there is every prospect that we shall witness the demise of most tropical forests within another few decades" (Norman Myers, Deforestation Rates in Tropical Forests and Their Climatic Implications \[London: Friends of the Earth, 1989\], p. 2). 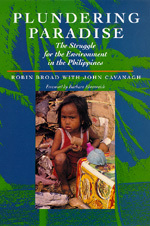 See also Myers's "Environmental Degradation and Some Economic Consequences in the Philippines," Environmental Conservation 15, 3 (Autumn, 1988). Back. Note 17: See Clad and Vitug, "Philippines: The Plunder of Palawan." Back. Note 18: Betsy Hartmann and James Boyce, Needless Hunger: Voices from a Bangladesh Village (San Francisco: Institute for Food and Development Policy, 1979). See also their A Quiet Violence: A View from a Bangladesh Village (San Francisco: Institute for Food and Development Policy, 1983). Back. Note 19: David M. Kummer, "Deforestation in the Post-War Philippines," Ph.D. dissertation, Boston University, 1990, p. 236. Back. Note 20: World Wildlife Federation, "First Debt-for-Nature Swap in Asia," news release, June 23, 1988, p. 1. Back. Note 21: Sylvia Mayuga, "The Last Preserve," Philippine Daily Globe, May 30, 1989. Back. Note 22: McDonagh, The Greening of the Church, pp. 74-106; Richard P. Tucker, "Five Hundred Years of Tropical Forest Exploitation," in Suzanne Head and Robert Heizman, eds., Lessons of the Rainforest (San Francisco: Sierra Club Books, 1990); Dennis M. Roth, "Philippine Forests and Forestry, 1565-1920," in Richard P. Tucker and J. F. Richards, eds., Global Deforestation and the Nineteenth Century World Economy (Durham, N.C.: Duke University Press, 1983), pp. 35-49; and Porter with Ganapin, Resources, Population, and the Philippines' Future, pp. 23-33. Back. Note 23: Tucker, "Five Hundred Years of Tropical Forest Exploitation," p. 49. "Raw logs" refers to SITC category 242, "rough wood," in United Nations, 1978 Yearbook of International Trade Statistics (New York: United Nations, 1979), p. 63. Back. Note 24: Delfin Ganapin, Jr., "Environmental Crisis in the Philippines: A Challenge to the NGO Community," speech at symposium of the Philippine Rural Reconstruction Movement (PRRM), Quezon City, June 29, 1989. Back. Note 25: Porter with Ganapin, Resources, Population, and the Philippines' Future, p. 27. Back. Note 26: Guppy, "Tropical Deforestation: The Global View," p. 949. Back. Note 27: See Marites Danguilan-Vitug, "Fighting for Life," Far Eastern Economic Review (June 13, 1991). Back. Note 28: World Bank, Philippines: Environment and Natural Resource Management Study, A World Bank Country Study (Washington, D.C.: World Bank, 1989), p. 5. Back. Note 29: Figures from Republic of the Philippines, Department of Budget and Management, Budget of Expenditures and Sources of Financing, 1987-1991, quoted in Jenina Joy Chavez, "Bogged Down (by) Budgeting," Ibon Facts & Figures 14, 1 (January 15, 1991): table 1. Back. Note 30: For more on the World Bank and the International Monetary Fund, see Robin Broad, Unequal Alliance: The World Bank, the International Monetary Fund, and the Philippines (Berkeley: University of California Press, 1988; paperback ed., 1990). On the connection between debt and environmental destruction, see Susan George, The Debt Boomerang: How Third World Debt Harms Us All (London: Pluto Press, 1992), pp. 1-33. Back. Note 31: "A Brazilian Tale," Economist (February 18, 1989): 31. Back. This gripping portrait of environmental politics chronicles the devastating destruction of the Philippine countryside and reveals how ordinary men and women are fighting back. Traveling through a land of lush rainforests, the authors have recorded the experiences of the people whose livelihoods are disappearing along with their country's natural resources. The result is an inspiring, informative account of how peasants, fishers, and other laborers have united to halt the plunder and to improve their lives. These people do not debate global warming—they know that their very lives depend on the land and oceans, so they block logging trucks, protest open-pit mining, and replant trees. In a country where nearly two-thirds of the children are impoverished, the reclaiming of natural resources is offering young people hope for a future. Plundering Paradise is essential reading for anyone interested in development, the global environment, and political life in the Third World. Robin Broad is Assistant Professor of International Development at American University and the author of Unequal Alliance: The World Bank, the International Monetary Fund, and the Philippines (California, 1988). John Cavanagh is Fellow at the Institute for Policy Studies and co-author, with Richard J. Barnet, of Global Dreams: Imperial Corporations and the New World Order (1994).